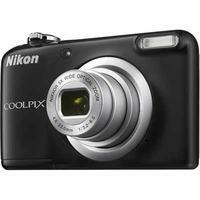 Simple-to-use, reliable and easily portable, the Nikon Coolpix A10 digital camera with 5x optical zoom lens and 16-megapixel CCD sensor is designed to give you great results and make taking photos fun. Its 2.7-in LCD monitor makes framing shots effortless, and Scene auto selector selects the best scene mode for your shooting conditions. Switch to HD movies at the touch of a button, while Motion blur reduction reduces camera shake for sharp videos and images. This camera runs on two AA batteries (included).